The Lakeview band performed in Many Feb. 26. On first row from left are the late Kentrae Jones, Serenity Bush and Jordon Kirts. On second row are Braylee Layfield-Bruce, Amber Hembree, Sophia Kerry, Kyla Williams and Jennifer Williams. On third row are John DeSoto, Zoie Britt, Carleigh Tune, Harli Thomas, Shiann Harris and Tramon Lloyd. On fourth row are Stephan Prudhomme, Kerya Williams, Adrian Davis, Victoria Lane, Emma McDonald and Jaron Petite. On back row are James Earp, Nicholas Wiggins, Jo Porter, Myla Porter, Simon Messengmba, Joshua Graham and Kain Curtis. Not pictured are Mathew Johnson and Shaneta Williams. The Lakeview Jr.-Sr. High Concert Band was the recipient of the Sweepstakes Trophy at the LMEA District II Large Ensemble Performance Assessment at NSU Friday, March 22. The band received a superior rating from all six adjudicators, both in stage performance and in sight reading. Their stage performance consisted of three selections. First, the band performed The High School Cadets March by John Philip Sousa, arranged by Michael Story. This was followed by Three Scottish Folk Songs by John Edmondson. The conclusion of the program was Trails of Glory: A Western Overture by James Swearingen. 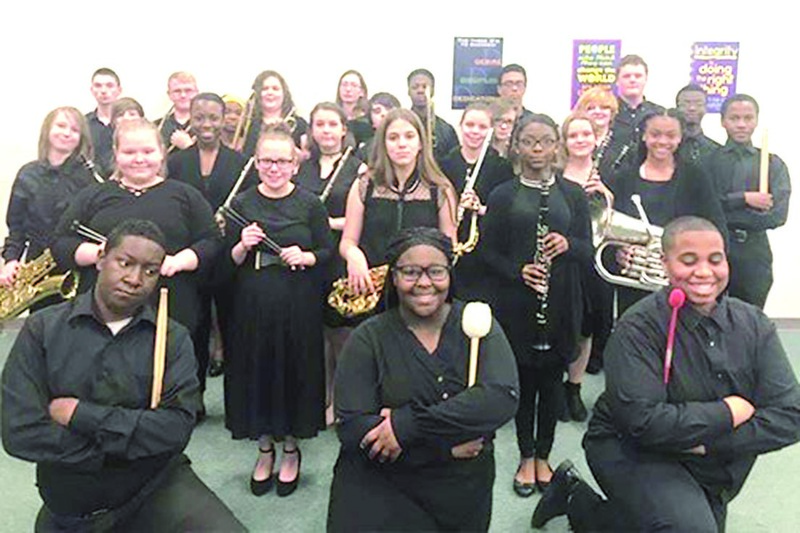 Lakeview had previously performed at a concert band festival at the Sabine Theater in Many Feb. 26, where they also received superior ratings from every adjudicator. “The performance at NSU on March 22 was a difficult one for us,” commented band director Denise Roper. “One of our band members, freshman snare drummer Kentrae Jones, passed away Monday, March 18. We were mourning the loss of a beloved student throughout the week and on Friday, we dedicated our program to him. At the end of Trails of Glory, we received a standing ovation and several of the students and I were moved to tears by this. I told my students I have never been more proud of them. They were very brave to perform when we were in such an emotional state.” The funeral for Jones was the next day, and the band performed an arrangement of Nearer, My God, to Thee as a tribute to their classmate. At the LMEA District II Performance Assessment March 22 at NSU are, on front row from left, Jennifer Williams, John DeSoto, Zoie Britt, Kerya Williams, Amber Hembree, Sophia Kerry, Kyla Williams, Shiann Harris, Braylee Layfield-Bruce and Serenity Bush. On second row are Shaneta Williams, Jaron Petite, Stephan Prudhomme, Adrian Davis, Harli Thomas, Carleigh Tune, Tramon Lloyd and Emma McDonald. On third row are Myla Porter, Joshua Graham, Jo Porter, Nicholas Wiggins, James Earp, Simon Messengmba, Kain Custis, Victoria Lane, Jordon Kirts and Mathew Johnson.